Further to recent enquiries from Tanker Operators about minimum number of closed chocks for receiving vessels we've made a review of available industry guidelines and the findings are shown below for your reference. The number of closed chocks for receiving vessels does not rely on the relevant number of chocks of discharging vessel. The number of closed chocks is extracted and denoted from the number of required lines for mooring. Recommended practice is that one line per closed chock. Exceptionally, max two lines could be used as per below paragraph 6.6.2 B, subject that protective sleeves are present and the nearby bits can withstand the imposed loads. According to this, closed chocks are not enough in order to have 1 mooring line per closed chock and thus risk mitigation measures should be taken in order to avoid chaffing of mooring lines. A. As a general guideline, below figure, taken from Reference 3 [ OCIMF], illustrates a recommended and proven mooring arrangement for a transfer operation in offshore waters. Ideally, all mooring lines should be deployed from winch drums and the use of lines turned-up on bitts should be avoided. A prime consideration in mooring during STS operations is to provide closed chocks for all lines to prevent the possibility of mooring lines chafing against each other, the ships or the fenders. This is critical in view of the large relative freeboard changes between the ships. A. It is recommended that the chocks are of the closed type since the relative freeboard between the two ships will change significantly during the STS transfer operation. If the lines are of wire rope, the opening of the closed chocks must be large enough to permit easy passage of the special shackle connecting the tail to the wire rope. A. When organizers are planning a ship to ship (STS) transfer operation they should ensure that the ships to be used are compatible in design and equipment. A compatibility assessment should be undertaken to confirm the suitability of the vessels for the planned operation and to identify any aspects that may require particular management. B. STS compatibility assessments should include, but not be limited to: Mooring arrangements, including the type of mooring lines and the requirements for enclosed fairleads. 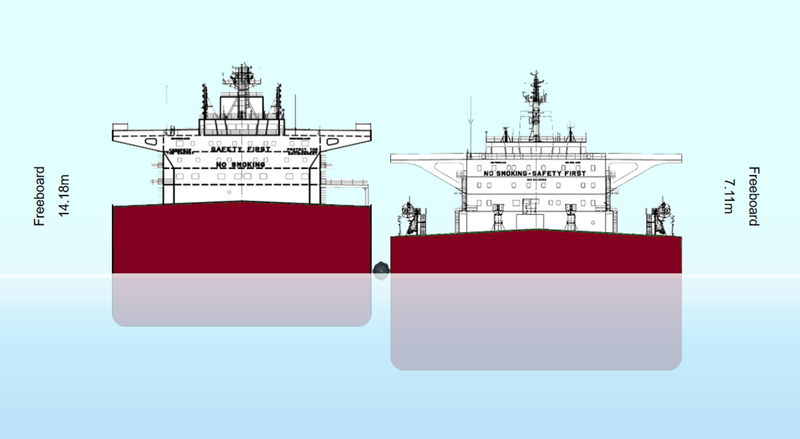 A. Mooring lines leading in the same direction should be of similar size and material. A. Suitable rope messengers should be made ready on both ships and, in addition, rope stoppers should be rigged in way of relevant mooring bitts. Where possible, heaving lines and rope messengers should be made of buoyant materials. A minimum of four messengers should be provided and ready for immediate use. For large ship operations, it is recommended that messengers of 40 mm diameter are employed. 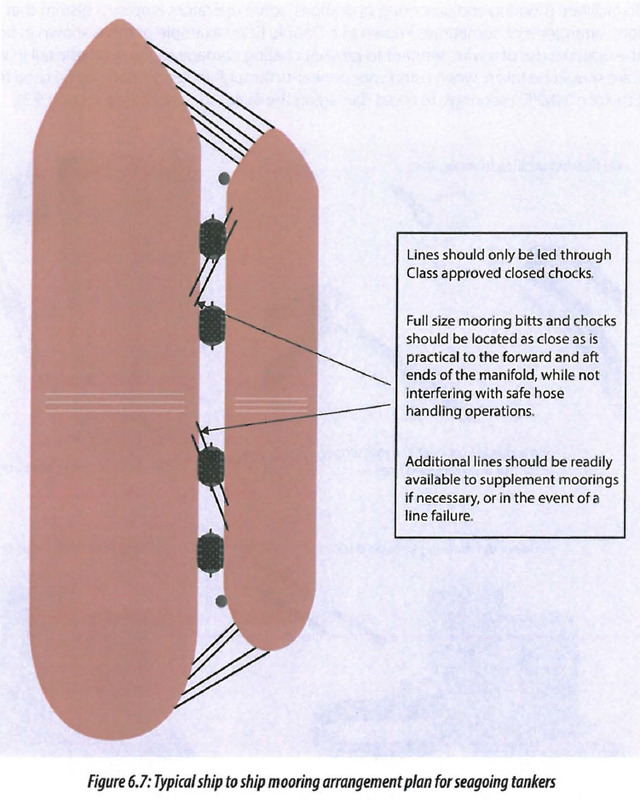 Lines should only be led through closed fairleads suitable for STS operations (see section 9.3). B. Mooring lines should be deployed in accordance with the mooring plan. When prevailing weather conditions or weather forecasts require it, additional lines should be deployed. It is recommended that no more than two mooring lines are placed through each chock and secured on a set of bitts. A. All mooring lines should be passed through fairleads and be secured to bitts, bollards or cleats with an adequate safe working load (SWL). A. The mooring configuration should be discussed and agreed in advance between the mother ship and vessels expected alongside so that crews have adequate notice to prepare the moorings and to ensure that there is no confusion as to when the mooring ropes will be sent out, and from which location. STS transfer operations will often involve mooring alongside vessels with a higher freeboard and it is recommended that all lines are led through closed fairleads to avoid the possibility of lines jumping out of the lead. A. It is important that ships involved in STS operations are equipped with good quality mooring lines, efficient winches, well placed and sufficiently strong closed fairleads, bollards and other associated mooring equipment. B. Only fairleads of the enclosed type should be used to ensure effective control of mooring lines as the freeboards of the two ships changes. Fairleads should be large enough to allow the mooring line (plus any soft rope tail and shackle) to pass through comfortably. Open fairleads, even those fitted with stopper bars, are not recommended for STS operations. C. The recommended minimum number of closed fairleads on the larger ship for STS operations is 3 aft and 4 forward. Typically, a mooring pattern for exposed locations for lightering vessels not fitted with special mooring arrangements would consist of at least six head lines, two forward and two back springs, and four stern lines. Where specialised mooring equipment is fitted (e.g. on dedicated STS transfer ships) the number of headlines could be reduced to four where this has proven to be reliable for the local operating environment. Summing up, open chocks should not be utilised for STS operations. Especially when the receiving vessels’ freeboard is smaller than the discharging. In case you pass more than one mooring line through closed chocks, without protective sleeves, your mooring lines/tails will end up line the ones attached in our latest circular. Attached are recent pictures from an STS ops where they passed 2 or 3 lines from one closed chock.